The Mayor of Toronto has found himself in difficulty over the past few months having been found in conflict with rules concerning fund raising and the use of his office’s influence. The courts have been ruling on this for some time and now the case moves to the Supreme Court. For the time being however the Mayor is allowed to remain in office. Whether the Mayor should or shouldn’t be allowed to stay in office is not in my mind to state. What caught my attention was tonight’s news. Not that the news always tends to be fair or impartial. But I listened to some of his political supporters and detractors. And I was struck by one thing. I believe that the Mayor has indeed been put in a position to really learn a significant lesson about leadership and accountability. As Jason points out in his blog, the Mayor’s interest and support of young people through football is to be applauded and admired. Now to see if he is willing to see that this kind of dedication to people can be demonstrated in the way in which he operates in office. It is not acceptable for the Mayor to be willing to flaunt the law whether driving and texting on his smart phone or using his office to support a private interest. If the Mayor is truly sorry and has learned a valuable lesson as he indicates then he may yet win the hearts and minds of those of us who have been disappointed in his behaviour over the past year. It is a truth that we are all changing and we should never believe that others will never change. 13 1-3 Be a good citizen. All governments are under God. Insofar as there is peace and order, it’s God’s order. So live responsibly as a citizen. If you’re irresponsible to the state, then you’re irresponsible with God, and God will hold you responsible. Duly constituted authorities are only a threat if you’re trying to get by with something. Decent citizens should have nothing to fear. There has always been power in the hands of the masses – it exists today in every country. In some countries fear of reprisal keeps citizens quiet. Speak up and you could be thrown in prison, have your house burnt to the ground or worse disappear never to be seen or heard from again. In spite of those fears time and a belief that death is better than suppression causes the masses to gather together and rise up. We’ve seen it dozens of times – the Berlin Wall comes tumbling down. Courage rules for courage is not the absence of fear but rather the admission that fear cannot rule. In other countries it isn’t fear that keeps the masses from exercising power. Quite the opposite it is apathy. A common disregard for the power of the vote. Why vote, some say, it won’t change anything. Just like the frog that is boiled by starting him in cold water and slowly turning up the heat democracy somethimes keeps citizens from believing that anything is at stake. 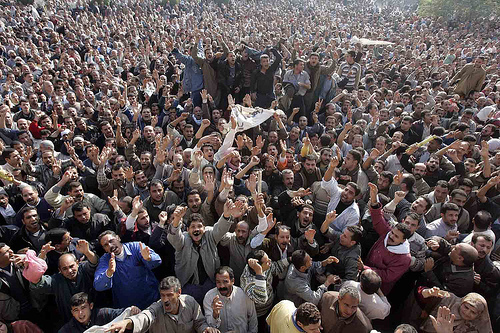 Today Egyptians are exercising their power. 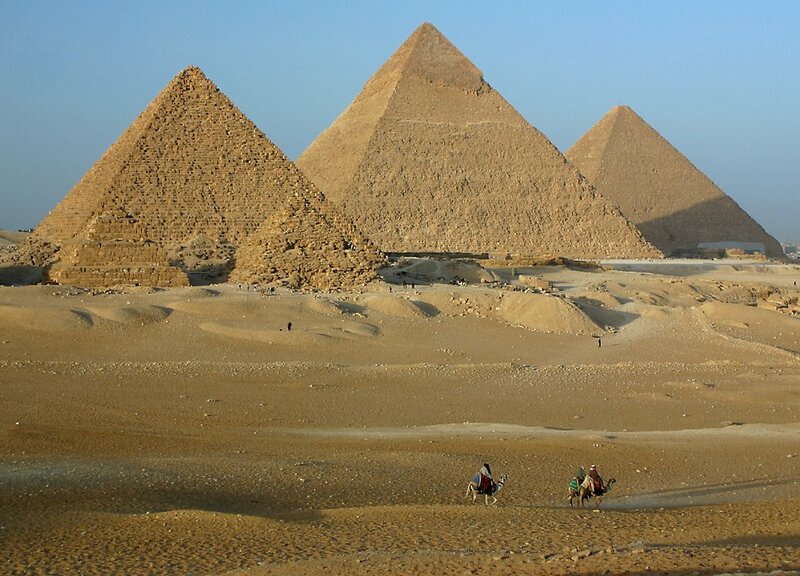 The crumbling pyramids are a good symbol for government – as impressive as they seem they won’t last forever. In Alberta the Premier has declared he won’t be running in another election – and warned that US style attack ads are making their way to Canada. They have been here for some time. The PC party has used them effectively to win elections – with minority power – but effectively enough to stay in power for 5 years now. The Liberals are crying fowl and pointing with some sense of indignation at the PC party over such vile tactics…but who remembers the attack ads of the Liberal party pointing to a rising power in the west – the Reform Party warning the citizens of Canada that voting for such a right wing party was like handing the reigns of power over to a white-supremists terrorists. Preston Manning was painted as a “scary leader”. US style hate politics are well entrenched in Canada Mr. Stelmach. But I understand what you’re saying. The power for good government and good manners in politics still rests with the citizens of Alberta. Will we exercise that power? If we did we would not support parties or candidates that used such tactics. This evening I sit in a warm home with a fire burning gently and music playing gently in the background. No fear of riots or protests. No fear of oppressive government. The threat to our way of life is much more subtle. We are comfortable – not really aware of the growing need to be engaged in our world, especially as Christians.